by Chris Woodford. Last updated: July 17, 2018. Do you ever find yourself looking at your watch and thinking "This call's costing me a fortune." If you do, you're still stuck in the 20th century with telephone technology that's barely changed since the 19th! In the 21st century, there's no reason why we should be paying through the nose, by the minute, to use a telephone network when most of us now have access to a very credible alternative: the Internet. After all, if the Internet (which relies on large parts of the telephone network) can carry text, images, and video clips, it should be able to carry people's voices just as easily. That's the thinking behind VoIP (Voice Over Internet Protocol) which, simply stated, means using the Internet to make and receive telephone calls. How exactly does it work? What are the advantages and the drawbacks? Let's take a closer look! Artwork: VoIP means making telephone calls using your computer, with the sound of your voice converted to digital data that travels over the Internet using the Internet Protocol—in other words, in exactly the same way as Web pages, downloads, emails, or any other Internet data. To lots of people, using the Net means looking at YouTube videos or buying books from Amazon.com—but both of these things are really about the World Wide Web, not the Internet. The Internet is the worldwide network that links virtually every modern computer on the planet, and it's made up of telephone lines, satellite links, fiber-optic cables, and old-fashioned copper wires. The World Wide Web (all those shopping sites, home videos, and so on that you browse from your computer) is just one of the things that uses the Internet; email is another. The Internet is designed so that it can send all kinds of information, in all kinds of different ways, between the various computers that it connects together, and without any kind of rewiring or redesign. (Technically, this is called the end-to-end principle.) That's why, in the mid-1990s, some clever technical people were able to figure out how to send telephone calls over the Net, much like any other kind of information. This was the birth of VoIP. All the information that travels over the Net—from the latest music videos on YouTube to the confirmation email from Amazon that your book is on its way—is sent by a method called packet switching. Something like an email, which might be pages and pages of characters, isn't actually sent as one big chunk: when it leaves your computer, it's broken down into many small pieces called packets, each of which travels independently across the Internet (theoretically by a completely different route from other packets) before being reassembled into a copy of the original email when it arrives at its destination. It's a bit like sending a book through the post not as a big fat parcel but by putting every single page into a separate envelope, individually addressed and dispatched. It might sound odd to send things this way, but packet switching is actually an extremely quick and efficient way of handling the billions of emails, web pages, and everything else that has to zip back and forth across the Net every single day. (You can read more about how it works in our main article on how the Internet works.) All the computers connected to the Internet understand how to send and receive packets like this; thankfully, they all agree to work in exactly the same way using exactly the same system, which is known as the Internet Protocol or IP. (One of the key parts of the IP that you may be familiar with is that every computer can be "addressed" by quoting a unique number, known as its IP address, which is a bit like the computer equivalent of a telephone number or building address. Currently most computers have IP addresses made from four pairs of two digits separated by points, such as 12.34.56.78. Photo: Packet switching is how data travels over the Internet. It's a bit like moving house by breaking the building into individual bricks and putting each one in the mail! It sounds crazy, but it works extremely efficiently. The Internet has only one job to do: to keep packets moving back and forth. The computers, fiber-optic cables, and other systems that make up the Net don't know what packets they're moving or why—and they don't care. A packet might be a piece of a photo you took on holiday in Florida, or it could be part of an email telling someone they're fired. As long as the data you want to send is in the form of packets, and they're formatted in the correct way according to the IP, you can send absolutely anything over the Internet. How, then, do you send a telephone call over the Internet? There are really three separate problems to solve before you can do it: alerting someone that you want to call them, turning your voice into digital sound and sending it over the Net (and receiving replies in the opposite direction), and "interfacing with" (linking in to) the ordinary telephone network, if your call is going to a traditional landline telephone or cellphone (mobile phone). Let's look at each of these in turn. When you make a traditional telephone call to a friend, you lift the receiver and listen for the dial tone before punching in someone's number. What's happening here is that you're opening up an electric circuit between your home phone and the telephone exchange. When you dial the number, the exchange opens up a second circuit to the receiver's phone, causing their handset to ring. As soon as your friend lifts the receiver, there's a complete circuit open between your two phones and you can start to talk ("send and receive voice data", if you prefer). With VoIP, things are different. Internet telephony is much more like cellphone telephony, with people having unique telephone numbers that aren't permanently linked to one physical location: the person you're calling could be anywhere on the planet (and might not be in the same place two days running). So the first part of making a VoIP call involves your computer locating the receiver on the Internet, signalling their computer to receive a call, and, once that's done, the two computers agreeing the technical nitty-gritty of how they will actually exchange the data (just as fax machines and modems "handshake" at the start of a call). For VoIP to work effectively, every computer that uses it has to do these things exactly the same way—and that's why VoIP systems use carefully agreed international standards (known as protocols). The two protocols that cover signalling are technically known as H.323 and SIP (Session Initiation Protocol, sometimes also known as RFC 4168). Simply speaking, these protocols set up a communication route between two IP addresses (the sender's and the receiver's) across which the actual telephone call data can be sent and received. To send a basic telephone call over the Internet, you have to turn a speaker's voice into digital (numeric) form. That's relatively easy and the technology has been around for many years. (For example, when rock bands record CDs or MP3s, the noises they produce with their voices or instruments, which are analog sounds, are converted into numbers, which are digital signals, that can be stored or manipulated by computers. For more about the difference, see our main article on analog versus digital technology. This general process is called analog to digital conversion. When you listen to a CD or MP3, those numbers are converted back into sounds your ears can hear by digital to analog conversion.) The piece of software responsible for this process—converting audio sound into digital data and back again at the other end—is known as a CODEC (Coder-Decoder). The CODECs used for VoIP are designed to work optimally with sounds of frequencies from a few hundred hertz (Hz) up to perhaps 5000Hz or so (the frequency range of the human voice), although since 21st-century phone calls are just as likely to contain video (chat) data as voice sounds, VoIP systems often contain video CODECs as well as audio ones. Once a spoken voice has been turned into numbers, it's relatively easy to break it into packets and send it over the Internet to another computer, where it can be reassembled and turned back into the sound of a voice by exactly the reverse process. Again, the computers involved in sending and receiving the data have to work according to the same protocols (agreed methods). The data-sending protocol used in VoIP is called RTP (real-time protocol), and it's also the protocol that computers use for receiving streaming media (videos you watch as you download them, in real time, over the Internet). So far, we've seen that sending and receiving phone calls between two computers connected via the Internet is relatively simple; it's broadly the same as chatting online or exchanging emails, except that the data travelling back and forth is digitally encoded sound and travels in real-time. 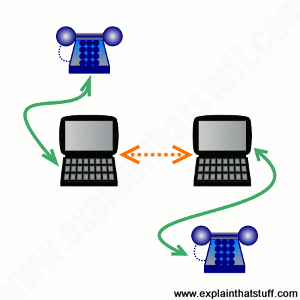 Making a telephone call from a computer to a traditional landline phone (or vice-versa) is more complex because it involves making a link from the Internet to the ordinary phone network (which is technically referred to as the PSTN or Public Switched Telephone Network). That complicates both aspects of VoIP that we discussed above. Call signalling is more complex, because the phone you're calling might be on either the PSTN or somewhere on the Internet—and it has to be located first. (One solution to this is to assign a special, nongeographical "area code" to VoIP numbers so they can be instantly identified and routed to the Internet.) Sending and receiving a phone call is also more complex because if you're calling from a VoIP phone to an ordinary landline handset, there's nothing at the receiving end to convert the digital data back into analog sound. So the data has to be converted before it reaches its destination. What makes phone calls like this work is an extra piece of equipment known as a gateway, which acts as a bridge between the Internet (on one hand) and the PSTN (on the other). You can think of a gateway as a kind of translator that converts telephone calls in IP-format into traditional signals that ordinary phones can understand (and vice versa). It's also involved in call signalling, so when you dial a landline from a VoIP phone, the gateway converts the call-signalling data into a format that the PSTN can understand (and rings the landline the old-fashioned way). Photo: A gateway allows VoIP Internet phones linked to computers and routers (left) to communicate with ordinary landline phones connected to the PSTN (right). 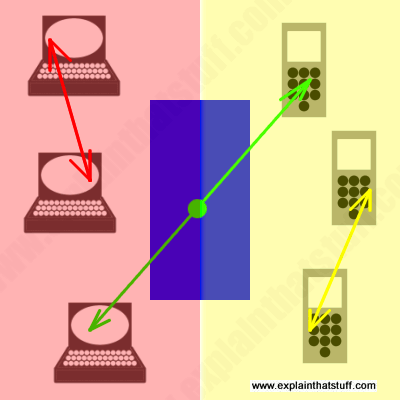 Two landlines can communicate directly over the PSTN (yellow line), just as two VoIP phones can connect directly over the Internet (red line) in something like a Skype call. But if a landline wants to communicate with a VoIP phone (green line), it has to go via a gateway (blue box). Simply speaking, there are three different kinds of VoIP. The simplest are VoIP telephone handsets that look and work much like traditional telephones, except that instead of being wired to a telephone line, they're either directly connected to your computer (by something like a USB cable) or indirectly connected to it by a wireless (Wi-Fi) router. You'll find a slightly different kind of VoIP on cellphones (mobile phones). You make and receive mobile VoIP calls much the same as normal cellphone calls but, instead of calls being sent and received on a permanently open line, like a traditional cellphone call, they're broken into packets and sent back and forth—rather like a web page that you're browsing with something like a smart phone. In other words, they're using packet switching over the cellphone network. A third kind of VoIP is entirely computer based; Skype™ is the best-known example. When you use Skype to call someone, it sets up a more or less direct connection (known as a peer-to-peer or P2P) connection with someone else's computer, across the Internet. You send and receive text messages, voice data, or webcam chat over this direct link. Apart from the initial logging on process, there is no intermediate computer managing the communication between the sender and receiver, which makes Skype relatively secure compared to other forms of telephone communication. Photo: Skype is the best known (although by no means the only) VoIP system. You can call any user just by entering their Skype username. Or you can use the Skype pop-up keypad to make calls to any phone, anywhere in the world, using the ordinary telephone network (PSTN). Skype is a proprietary VoIP system using its own protocol based on peer-to-peer (P2P) networking; essentially, it works by creating ad-hoc, direct communication between two computers on the Internet in a similar way to file-sharing systems such as KaZaa (developed by Niklas Zennström and Janus Friis—the same people who developed Skype). Apart from a logon server that grants access to the network, assigns unique usernames, and so on, Skype is completely decentralized and distributed: there's no centralized "Skype control system." At any given moment, there are something like 100 million Skype users logged on worldwide. When you sign on to Skype, your computer becomes one node in a global network of equal peers. Each Skype user runs a piece of software called a client that allows them to send messages to other Skype users, make calls, send files, and play real-time games. Each of the clients becomes an active part of the network and, whether it's actively sending messages or not, helps the network as a whole to locate and route traffic to other users. Within the network, some of the users with highest bandwidth and best connectivity, known as supernodes, act as traffic hubs. The network as a whole is made up of supernodes connected to one another, with each supernode linking to many ordinary nodes. Unlike other instant messaging programs (such as the Yahoo! and Microsoft Live Messengers and AOL's AIM), Skype is much more adept at communicating through firewalls by random selecting the ports it will use. As a consequence, it's much harder for system administrators to detect and block Skype than traffic between other Internet chat programs. Skype also uses encrypted communication between peers, which also makes it highly secure—and relatively hard for random eavesdroppers or law-enforcement agencies to monitor. The biggest plus point of VoIP is call cost, which is typically either free or much less than making traditional calls over the PSTN. (That's a huge plus point for customers, but a huge drawback for the big telephone companies, who've been forced to regear their businesses to meet the threat from Internet telephony.) VoIP is easy and often immediate to set up, and generally requires no long-term contract (although you do need to set up an account of some kind to create a phone number or user name where people can call you). You can usually send any kind of data over VoIP, from text and images of your computer desktop to voice and webcam chat. Another big plus is that VoIP liberates you from a fixed, physical location; if you have a Skype username, for example, you can sign in with it and receive calls from anywhere in the world. Photo: You can make a VoIP call from anywhere you can connect to the Internet, whether or not there's a telephone network or cellphone mast nearby. That's why VoIP has proved a big hit with the military. 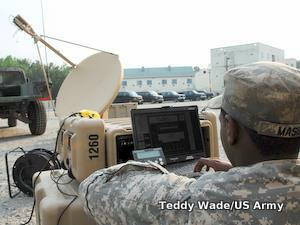 Here, a soldier is making a VoIP call with a laptop linked to the Internet via a radar dish and satellite connection. Photo by Teddy Wade courtesy of US Army. The biggest drawback of VoIP is call quality, which is neither as good or as reliable as you'd get with a direct call between two landlines. Although the sound quality itself may be poorer (it varies considerably according to the CODECs that are used), this is not usually much of an issue since most people are used to the highly variable quality of cellphone calls. Since VoIP calls travel back and forth as streams of packets, network problems that lead to the total loss of packets cause a degradation in call quality and a loss of communication—though that's also a problem people are used to with cellphones and poor signals. A much bigger issue is call latency, where delays in sending data across the Internet (coupled with the time it takes for the CODECs to process them) result in a significant lag between the sender saying something and the receiver hearing it (similar to a really bad international telephone call), which can lead to people talking on top of one another. A related problem called jitter can make snippets of conversation arrive in irregular bursts, separated by silences (it happens because a certain number of digital packets have to arrive from the Internet and be assembled before they can be converted into audible sounds), and this can also be very confusing to the people involved in a conversation. The "geographical freedom" of VoIP can also be a drawback in an emergency, because if you make an emergency call from a VoIP phone the emergency services cannot automatically figure out where in the world the call has come from. By the same token, nuisance calls made over VoIP may be much harder to trace or block. VoIP has grown enormously since it was first developed in the mid-1990s, especially with business customers. 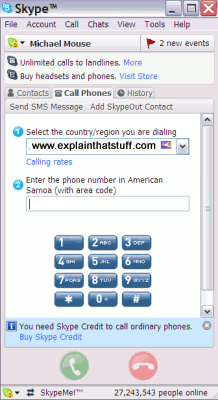 By 2013, the most popular VoIP service, Skype, claimed to have about 300 million active users (my own experience suggests around 50–100 million people may be logged in at any time); the current overall total is hard to establish, not least because some people have multiple Skype accounts (I must have over a half dozen for various purposes). In 2016, Skype reported massive growth in mobile-app use: "We've reached one billion Skype mobile downloads," and revealed that its hundreds of users had made "nearly two trillion minutes of video calls" since its video calling was released 10 years before. Even so, these vague figures (how many people downloaded twice on the same device or multiple times on different devices?) reveal very little about worldwide VoIP usage. That's not really surprising when you consider that this is a much more ad-hoc technology than traditional telephony, where there are actual, physical phone lines you can count. In July 2009, the International Telecommunication Union (ITU) reported that there were 34.6 million VoIP subscribers in Europe, with about a quarter of all fixed-line telephone subscribers using VoIP instead of the PSTN. Unfortunately, the ITU news and statistics blog tells us very little about current figures. A similar picture has emerged in Japan, where fast cellphone networks are widely available, and around a third of all telephone calls are now made by VoIP. In the United States, manufacturers such as 3Com report that something like a half of all new business telephones sold are VoIP models. In 2012, according to the New York Times, 42 million people were regularly using VoIP phones in the United States. Telephone companies offering only VoIP services are still much smaller than their PSTN rivals; one of the leading providers, Vonage, had 2.4 million registered customers as of June 2011, but in February 2017 was reporting "nearly 2 million customers worldwide" (it's uncertain whether these are directly comparable figures, but they came from the same sentence of the "About" page on their website at different times). Industry estimates suggest there were somewhere between 100 and 200 million VoIP subscribers worldwide by the end of 2015, although a mere six countries (the USA, China, Japan, South Korea, France, and Germany) represent about 80 percent of the market. A study by Future Market Insights forecast the global VOIP market would be worth $204.8 billion by 2020, comprising around 200 million subscribers. In the future, as broadband Internet and traditional telephony continue to converge, the strict split between the PSTN and the Internet is likely to disappear. It will be much more common to see, for example, Web pages with clickable links that make immediate VoIP calls to sales agents. Telephone calls are also likely to become more sophisticated, for example, with multi-way video calling over VoIP increasingly replacing two-way voice-only calling over the PSTN, and stereo VoIP calls replacing mono PSTN calls. Here's a quick summary of some key moments in VoIP history. 1994: Two young Israeli computer scientists, Alon Cohen and Lior Haramaty, invent an audio transmitter-receiver that can send and receive voice data in real-time over the Internet. 1995: Cohen and Haramaty's company, VocalTec, develops the first Internet telephone software (also known as a VoIP client). 1996: The first versions of the VoIP call-signalling standards H.323 and SIP are published. 2002: The final version of SIP is published as international standard RFC 3261. 2005: The commercial importance of VoIP becomes apparent when the eBay auction site buys Skype for $2.6 billion. 2005: Skype announces that 100 million people have downloaded its free VoIP software. 2007: Skype downloads reach 500 million. 2011: Microsoft buys Skype for $8.5 billion and its partner, Facebook, announces that it will incorporate Skype video calls into chats between Facebook friends. Skype announces 663 million registered users. 2014: WhatsApp, the popular mobile messenger, announces a new version incorporating VoIP voice calling. 2015: Global VoIP subscribers are predicted to reach 200 million. 2016: Skype announces that its mobile apps have been downloaded one billion times. Comparison of VoIP software: This useful Wikipedia article lists and compares widely available VoIP software for PCs, Macs, cellphones, and servers. VoIP for Dummies by Timothy V. Kelly. John Wiley and Sons, 2011. A simple, hands-on guide to using VoIP with your computer, written in the classic, lighthearted Dummies style. Voice Over IP Fundamentals by Jonathan Davidson. Cisco Press, 2006. A short (96-page), concise, technical overview of VoIP, including how the PSTN works, basic VoIP technology, VoIP protocols such as H.323 and SIP, and gateway controls. Packet Guide to Voice over IP: A system administrator's guide to VoIP technologies by Bruce Hartpence. O'Reilly, 2013. An advanced technical guide to VOIP—down to the level of packet switching. VoIP and Unified Communications: Internet Telephony and the Future Voice Network by William A. Flanagan. Wiley, 2012. A useful briefing aimed mainly at a business audience. Positioning VoIP as a disruptive technology, it explains the conceptual transition from circuit to packet switching, and describes how VoIP works with such things as voice, data and fax transmission. Moving Your Number to Google Voice by J. D. Biersdorfer. The New York Times, December 28, 2017. How can you use Google Voice to integrate your various telephone numbers and services? SkyDe Software Sends Hidden Messages in Skype Calls by Samuel K. Moore. IEEE Spectrum, January 15, 2013. How Skype can be used to send secret data using steganography (hiding messages in other data). Skype: How the online chat revolution changed lives by Katia Moskvitch. BBC News, 29 August 2013. How has Skype changed the world during its first 10 years? Microsoft Buys Skype for $8.5 Billion. Why, Exactly? by Peter Bright. Wired News, 10 May 2011. Analysis of Microsoft's decision to acquire Skype. Skype use may make eavesdropping passe by Peter Svensson (Associated Press), USA Today, 16 February 2006. Explores the difficulty of monitoring illicit communications over Skype. US Patent 5,825,771: Audio transceiver by Alon Cohen and Lior Haramaty, Vocaltec Ltd, October 20, 1998. The original VoIP patent, which describes how real-time audio can be sent across the Internet. H.323: Official specification from ITU-T. There's also a Wikipedia overview of H.323. SIP: Official 2005 specification (RFC-4168) from the Internet Engineering Task Force (IETF). There's also a Wikipedia overview of SIP.